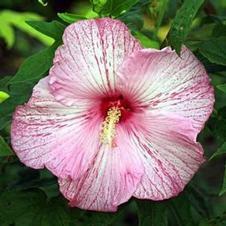 Welcome to Fleming's Flower Fields Hibiscus Informational Website! The only one of its kind! For over 60 years, Flemings Flower Fields, one the oldest and most well known hybridizing nurseries for cutting- edge perennial plants has been enhancing the lives and gardens of those who grow our winter hardy perennials. We are know world-wide for breeding the best quality, easiest-to grow, most adaptable and colorful plants. We can teach you best the ease at which you can have success with these exciting cultivars. 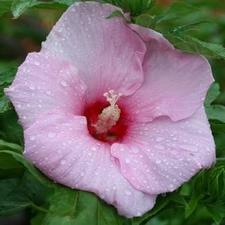 This site will tell you the History and proper Care of the Fleming Hibiscus, Crapemyrtle and others. As you will see, it is a facinating journey that has brought us to this place in Hibiscus History.. 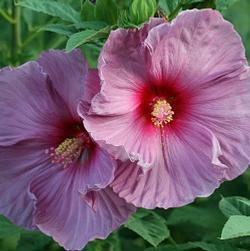 The hardies of the past helped lead hybridizers like the Fleming team to create landscape-worthy winter hardy Hibiscus that are much smaller plants with bigger more beautiful blooms and exotic reddish purple-colored foliage. Since the beginning of Fleming's Flower Fields the Fleming Brothers have been recognized as Perennial Pioneers (see attached articles in 'Fleming Fanatics'). Their drive and boundless love for horticulture led the industry to honor them with multiple awards, most notable being the Perennial Plant Associations "Award Of Merit" for lifetime breakthroughs in hybridizing. They are like the "superheros" of the breeding world with their once-thought-impossible achievements.. 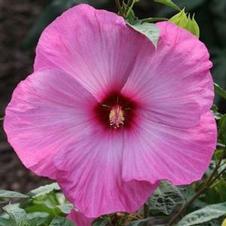 The acheivements that they accomplished in hybridizing are evidenced in the following impressive improvements in both Hardy Hibiscus and Crapemyrtle and explain their industry notoriety. Cold hardiness of at least -30 F; still the hardiest on the market! Flood and Drought tolerant; Pest resistant and adaptable to almost every zone! For years, breeders have tried to introduce a hardy strain of the South's beloved Crepemyrtle with its multitude of delicate flowers to the northern zones with little success until the Flemings breeding program again made the impossible 'possible'. The Fleming Dwarf and Hardy Crapemyrtle™, also known as the Fleming Filligrees™ series has brought some of the South to us Yankees. Their super hardiness of -30 F makes them available to gardeners all over the country, bringing a little Riviera to your back yard. The bright 'Red, Coral and Violet Fillis' stay 30" and under giving you a nice full shape with a decadent amount of billowing crepe flowers. You will know why people who go to the South for the first time usually remember the Crepe Myrtle trees so vividly. But these compact Fleming cuties are made for a modern garden like a bouquet of flowers all summer long. This super compactness and winter- hardiness, especially, really makes them unbelievable but there are other bigger and less hardy varieties besides the Flemings on the market that we will also discuss because we want to help you discover all of the great and bold perennials out there. We would be the first to admit we are biased towards the biggest flowered most colorful and reliable plants on the scene, but we try to stay extremely "picky" as this is what makes the best flower breeders. With greed we won't succeed in our gardens... and maybe the world.